A new report recommends that states like Maine switch to presidential primaries in hopes of involving more voters. WASHINGTON – A Republican National Committee report aimed at reviving and modernizing the party could re-ignite debate in Maine over the best way to select a presidential nominee. The report released Monday recommends that states, like Maine, that hold caucuses switch to presidential primaries in a reform effort that the authors say will bring more voters into a party that sounds “increasingly out of touch” and has lost its way with younger voters. The recommendation comes roughly one year after Maine’s Republican caucus fractured party activists, and coincides with a power struggle in Maine and nationwide between “establishment” Republicans and their libertarian or tea party counterparts. The primary recommendation is one of dozens in a blunt self-assessment of the 2012 elections. The report’s authors cited drastic changes that will be needed and rehashed many of the criticisms leveled against the party after its losses in November, particularly when it came to attracting new voters. Buried among the report’s calls for embracing technology and being more open to different viewpoints are recommendations for improving the nomination process. The authors call for limiting the number of primary debates, bumping up the date of the Republican National Convention and — perhaps most significant to Maine and other caucus states — encouraging states to switch to primaries. Maine is one of fewer than a dozen states that hold presidential caucuses rather than statewide primaries. In a caucus, local voters gather at a specific location to hear debates between candidates’ supporters before voting, often by show of hands. In primaries, voters simply go to the polls to cast secret ballots. 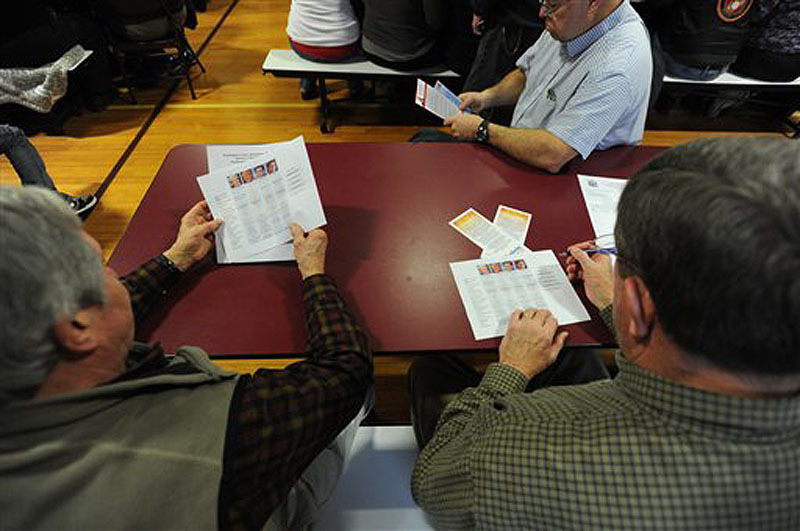 Maine’s 2012 Republican caucuses and state convention were anything but unifying for the party. Supporters of libertarian presidential candidate Ron Paul cried foul when party leaders announced that Mitt Romney had won the nonbinding caucuses even though some had not yet voted because their caucuses had been delayed by a snowstorm. The results did not change even after all of the votes had been tallied. But Paul’s well-organized supporters took control of the state convention in May and elected mostly pro-Paul delegates to send to the Republican National Convention. Half of those delegates subsequently lost their seats and were replaced by Romney supporters after a dust-up with Republican National Committee leaders that spilled onto the convention floor. Mark Willis, one of Maine’s three official representatives to the national committee and a libertarian Republican, disagreed with the report authors’ preference for primaries. Willis said caucuses engage grass-roots activists and help lay the organizational groundwork for the general election. They also give candidates with passionate volunteers but less money a chance to compete, he said. Willis expressed concern about the report’s proposal for shortening the primary season. While more people may vote in a primary, caucuses get people more involved, he said. Some Maine Republicans pushed to switch to a primary system last year after the clash between Paul and Romney supporters at the state convention. Former Senate President Kevin Raye, R-Perry, noted that primaries are held for every other major office in Maine, including governor and Congress. Raye introduced a presidential primary bill at the end of last year’s legislative session but it was spiked by a committee. He sees primaries as more inclusive than caucuses, which tend to attract far fewer participants. Rep. Roberta Beavers, D-South Berwick, has filed a bill in this legislative session to switch to a presidential primary system in Maine. Rep. Deane Rykerson, D-Kittery, has filed a bill request for nonpartisan primaries for presidential and congressional elections. Jason Savage, executive director of the Maine Republican Party, said party Chairman Richard Cebra was not ready to advocate for one system or the other Monday. Cebra would want to talk to legislative leaders about the issue, Savage said. “We will support the process that ensures that every Republican has a voice in the process,” he said.